Catch up with Cons’ last visit here. This time the NA is sporting new looks with the addition of a J-Spec bumper and fresh paint. A Selin Dual POP was added, we installed headers, SZ Sport Street TT, SZ Flywheel TT, and some high flow cat pipes. 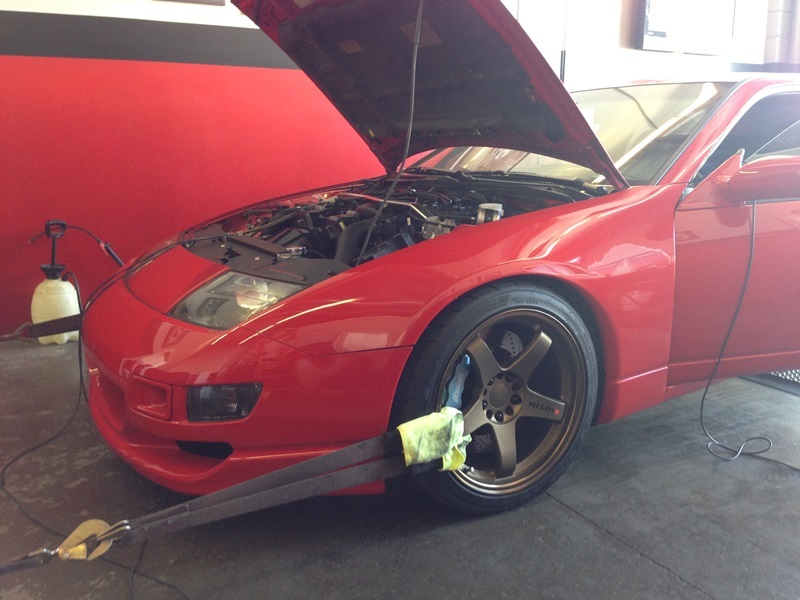 Once we were done with the installs we put the Z on the dyno. We got a good baseline of what the mods would do to the powerband. You’ll see the 3 runs pictured above. The blue run was our baseline after installing all the new mods. The NA lost power and torque up until 4600 RPMs (green run). Goes to show you that throwing on some parts won’t make for a desirable outcome sometimes. The blue run was from his last visit (from the link above). We went to work tuning the Z with its new mods and we picked up power and torque just about everywhere with substantial gains above 5000 RPMs. On the cursor you can see a gain of almost 30 whp and 20+ torque. Not bad! Joseph was looking a little more from his FX so we came to his aid. 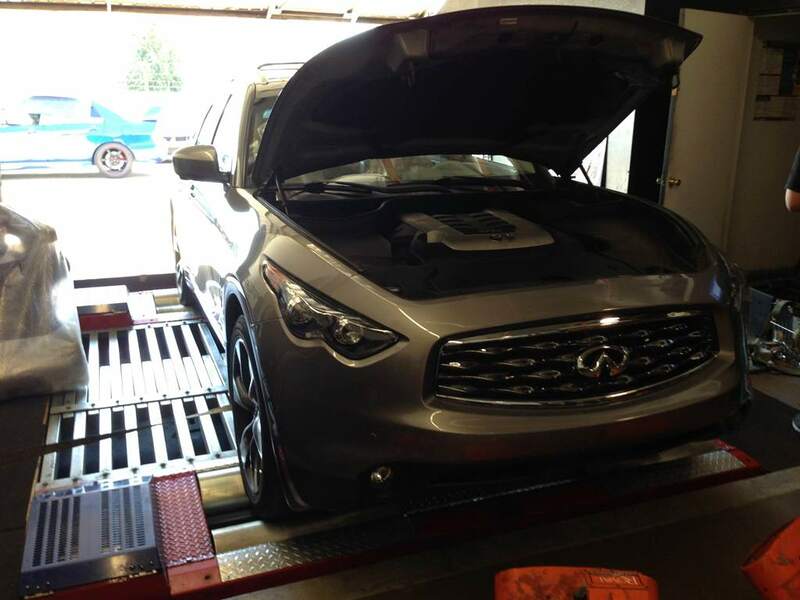 Having already done a muffler replacement and drop in air filters. We went to work tuning it. 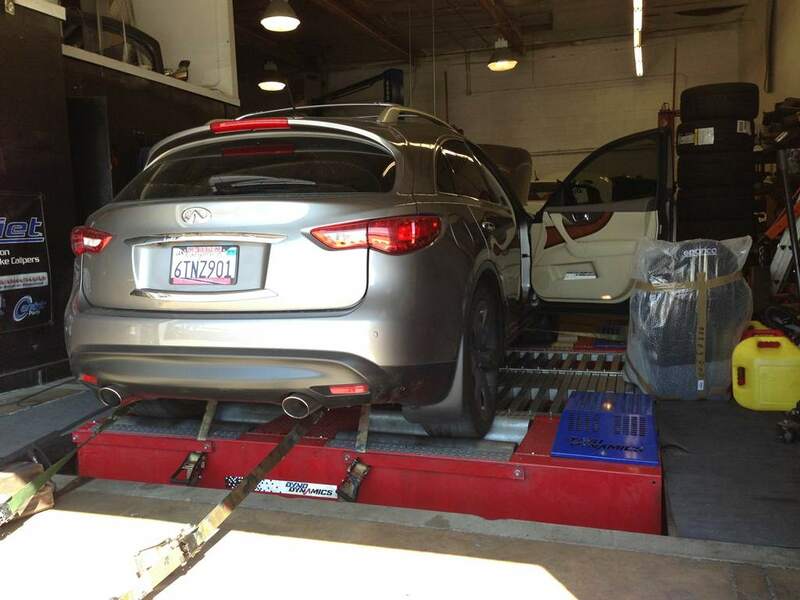 Since his FX is AWD, Khiem from down the street was kind enough for us to use his Dyno Dynamics Dyno. Green is the baseline pull and red was our final tuned pull. 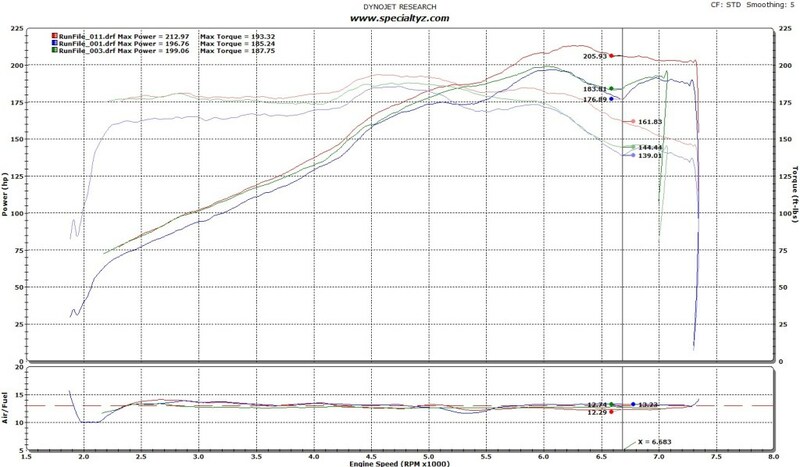 Nice gains of 20+whp and torque and no more sudden dips. 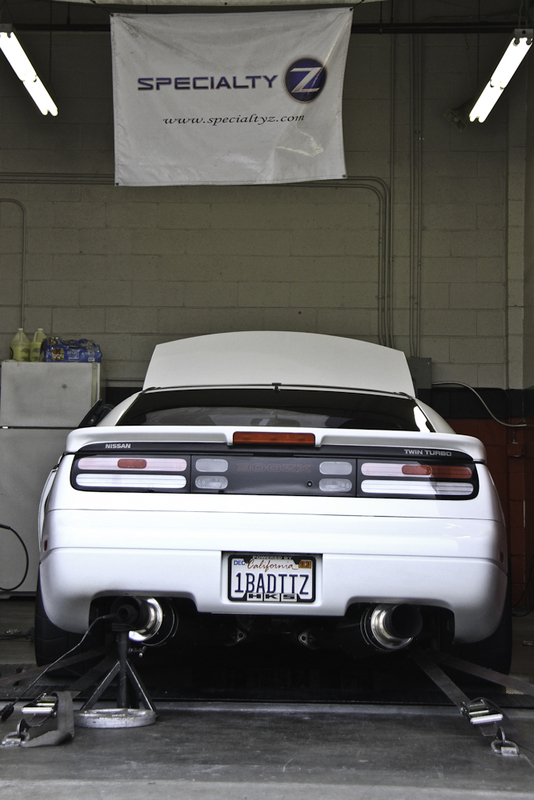 Last time we tuned Cons’ Z32, it was almost 6 years ago. Since then little has changed, however the new notable additions are Ash Massives and Ash Intercooler Piping. Inlets are still stock. The modifications that stayed the same are the following: HKS 2530 turbochargers, JWT 400+ Cams, factory cam gears, SZ 3″ Down Pipes and SZ 3″ to 2.5″ Test Pipes, HKS Hiper Catback, RPS Clutch & Flywheel, Nismo 740cc injectors & 300Degree Rails, Selin Dual POP Kit, and SZ Inconel Manifolds. Special thanks to Arnel for the great photos! 91 Octane tune with average boost levels of 15-16 psi. Just over 500whp! Here’s a great before and after on 100 octane. As I was writing this I realized that Cons’ Z was spinning tire on the roller by studying the dyno graphs. 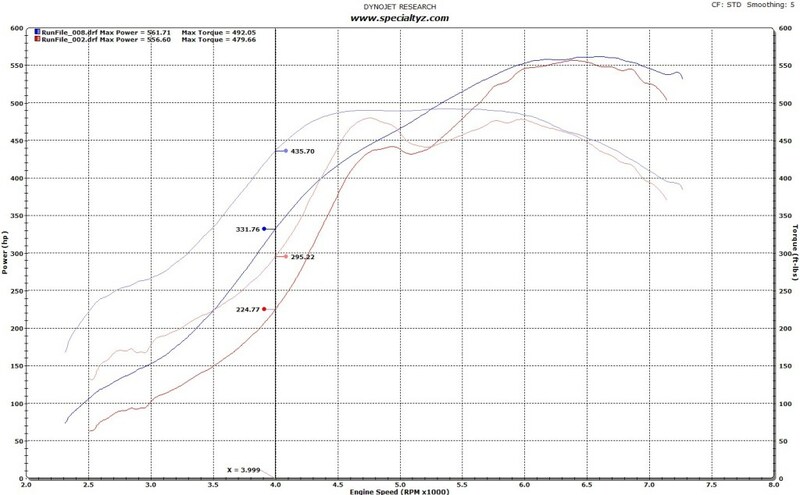 So the blue run isn’t even the true power and torque the Z is producing. It will be even higher. The red run was back in 2007, fast forward to 2013 and the blue run is much nicer looking. 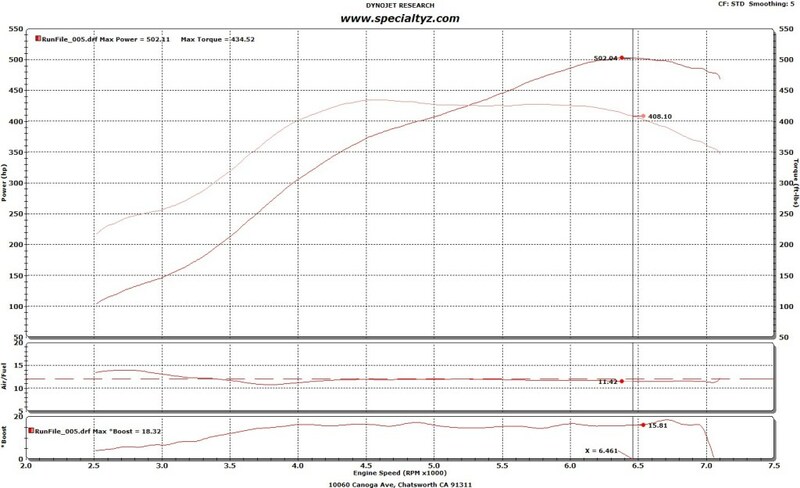 At the cursor point we picked up 140 torque and 107 whp!